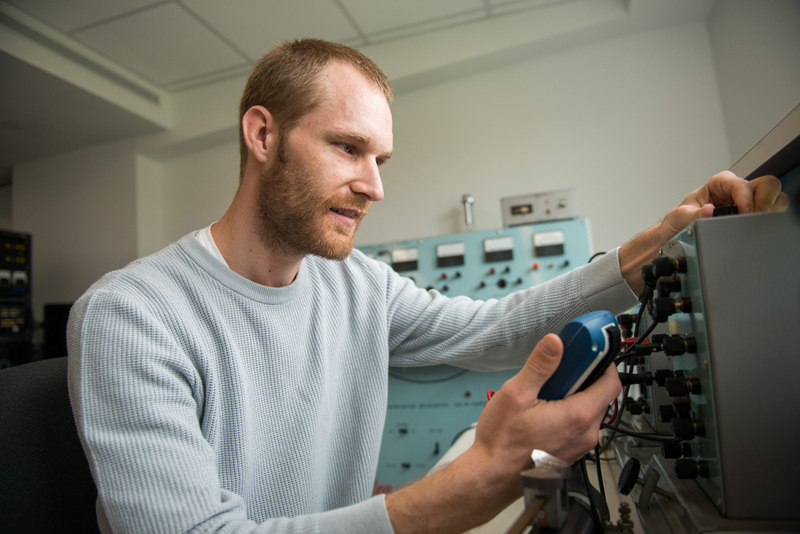 SUNY New Paltz student John Dawson ’18 (Electrical Engineering) will head to New Mexico this summer for a paid, three-month internship at the Air Force Research Laboratory at Kirtland Air Force Base, where he will work on experimental ultrashort pulse width lasers. The opportunity extends work he’s been doing in the Division of Engineering Programs here on campus. The internship focuses on cutting-edge laser technology with applications not only in defense, but also in medicine and manufacturing. Dawson is a five-year Army veteran who served in Iraq and exited with a rank of Sergeant, promotable to Staff Sergeant. He first arrived at SUNY New Paltz in 2012, and returned in 2014 following an extended period of travel. He came to the Division of Engineering Programs hoping to develop skills leading toward a rewarding career. During his time at New Paltz, he’s enjoyed extensive support from electrical engineering, particularly Associate Professor Mohammad Zunoubi, who has worked with the Air Force in the past and helped lead Dawson to the internship at Kirtland. The fact that Dawson enrolled at New Paltz, took a hiatus, and then returned, put him in a unique position to appreciate the College’s recent growth, both in terms of facilities and services. He’s witnessed first-hand the dramatic effect the Wooster Hall renovation, with the multiple new engineering labs it opened up, has had on the electrical engineering program. Dawson has also seen the development of the Office of Veteran & Military Services since the appointment of Coordinator Jason Gilliland, who came to New Paltz in 2014. “Since Jason came in, the progress has been amazing – they’ve been proactive about organizing events, helping veterans meet each other and creating a community,” Dawson said. Dawson’s internship begins on May 20, and will end in time for him to return to campus in fall 2017 and get back to finishing his degree. He’ll have an opportunity to be invited back to Kirtland for a second summer, following his graduation with the Class of 2018. To learn more about SUNY New Paltz’s efforts to support veteran, military and dependent students, please visit the Office of Veteran & Military Services online.